Stock thickness is very important for your product presentation and safety. In general, thicker stock normally represent expensive look & feel. There are many stock thickness types available in the market and you need to understand and decide which one is the best for your cosmetic Products. 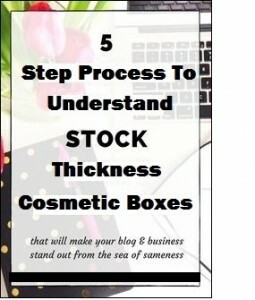 Below are the 5 steps those help you understand and decide the thickness for your cosmetic boxes for your products. Below are the 5 important steps those should be considered before deciding the thickness of the cosmetic product packaging! While deciding the thickness or the type of stock used for packaging, product safety is the first thing that should be considered and analysed. If your cosmetic product is a glass bottle and have size around 3″x3″x5″ or more then 24 pt or 28 pt card stock should be used to provide safety to the glass bottle. Amazon has a product safety test and they throw the cosmetic boxes with your product inside from 5 feet height to test safety and if the product inside gets damage, they fail the test for that specific cosmetic packaging boxes. Before deciding the stock thickness of your cosmetic packaging boxes, its important to understand the target market for your product. If you want to sell your product online then you need to check certain guidelines for your online vendor who will sell your products. If you are sending your products to Amazon then you need to read their packaging guidelines in details and understand the requirements before finalizing the stock thickness for your cosmetic boxes. For products those are going on the shelf, you can chose the packaging that helps product stand tall on the shelf and not week. Thick material boxes have a great presentation so if the presentation of the box is important then you should go for heavier stock like 32 pt or 38 pt stock. Chipboard stock is also a very thick material and is used for pre-assembled boxes those are used for presentation purpose. If the presentation of the packaging is not that important then you can chose the regular 16 pt or 18 pt SBS card stock which is a standard and good quality cardboard used for cosmetic packaging. Outsourcing and online selling these days are at height! Many Entrepreneurs create a cosmetic product and then sell them online at Amazon or other online retailers. For packaging of the cosmetic product, guidelines of the retailers is very important. Some of the retailers like Amazon have very strict guidelines and they don’t accept your product until you pass their guidelines. So you must understand the guidelines and follow those or you can hire a third party packaging expert like www.myboxprinter.com to help you finalize and print your packaging according to Amazon guidelines. Competitor Analysis is also very important in deciding the thickness of your packaging stock. Check similar products other vendors are offering and get their samples and check the stock types and thickness they are using and then decide your stock after your analysis. ← How to Decide Which Cardboard is Best for Your Custom Boxes?